The Tarts and the Puffs…an East Side Story | Go Here! Eat This! Once a year, my BFF and I spend one day in the city shopping and eating and just spending the day together without children or husbands. We started doing this a few years ago for our birthdays, as they are only about 3 weeks apart. It truly is one of our FAVORITE days of the year. We decided to start our day off with brunch on the Upper East Side (UES) and try the newly opened Brasserie Cognac East (963 Lexington). 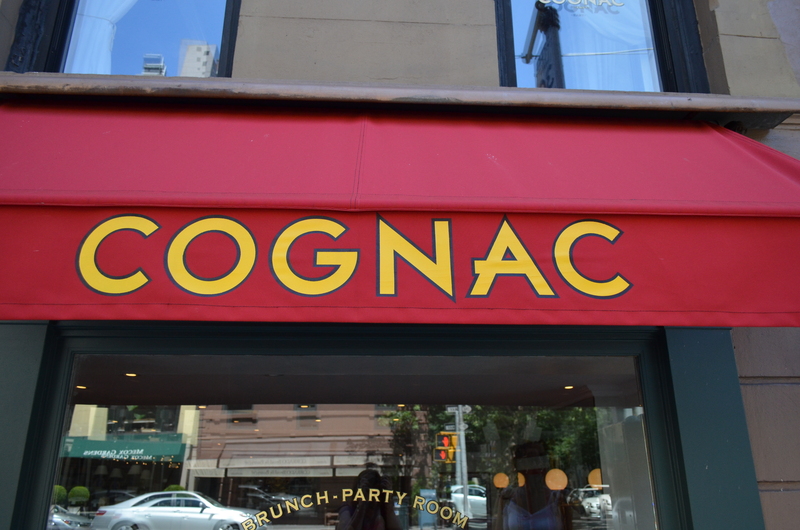 The original Cognac (1740 Broadway) is where we celebrated my hubby’s 40th this year with a big brunch and it was fabulous, so we decided to try the new spot on the east side! When we were planning this, I knew which dish I wanted and what I was going to blog about. Sometimes you eat out and you remember the ambiance and the conversation, but honestly a lot of times you simply do NOT recall a thing you ate! When food is memorable, you know it’s good. I remembered! 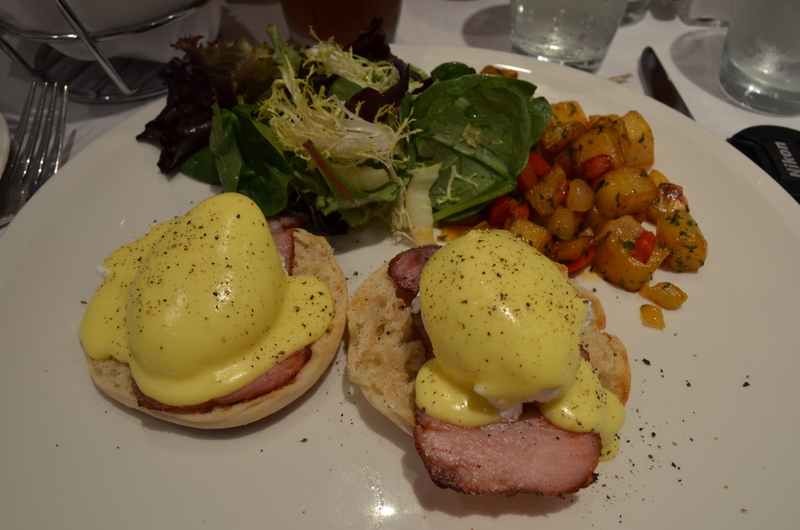 It’s worth mentioning that Brasserie Cognac has a VERY reasonable Brunch Prix Fixe for the UES. At only $32.95 you get a cocktail (we opted for Bellinis), an appetizer and a main course. Now I veered a little off course of the Prix Fixe because I ordered the Tuna Tart as my appetizer which isn’t included. But TRUST me, it was worth it. 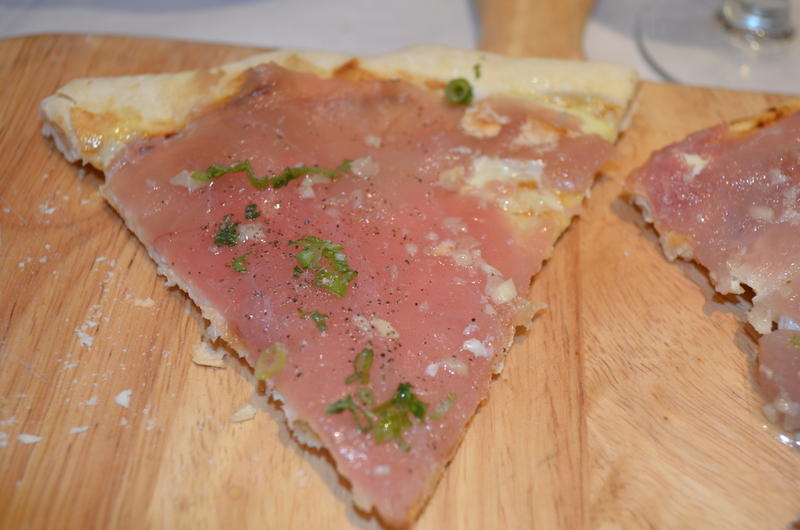 The Tuna Tart is a flambe crust, kind of like a flat bread, topped with sushi grade tuna, hot mustard cream and sprinkled with pickled ginger and scallions. It is a meal in and of itself and the flavors explode in your mouth. It is DELECTABLE. 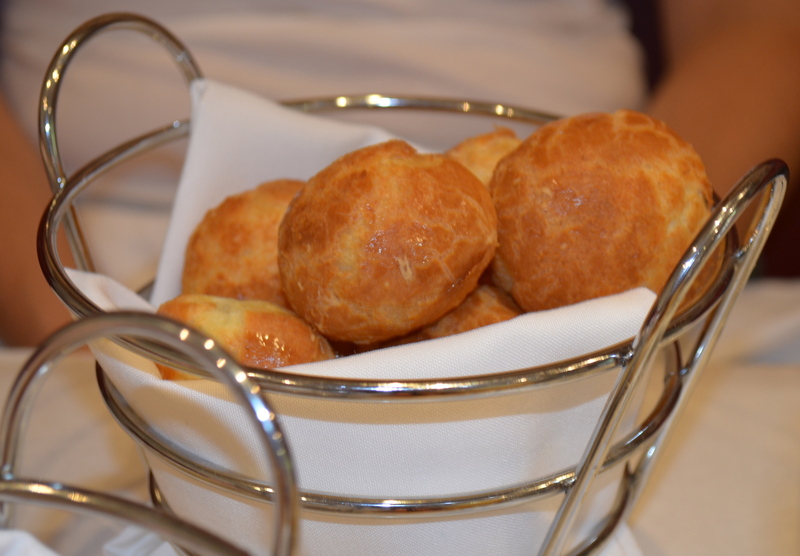 My friend always gets the Gougeres, a basket full of warm, moist cheese puffs that are a decadent treat. 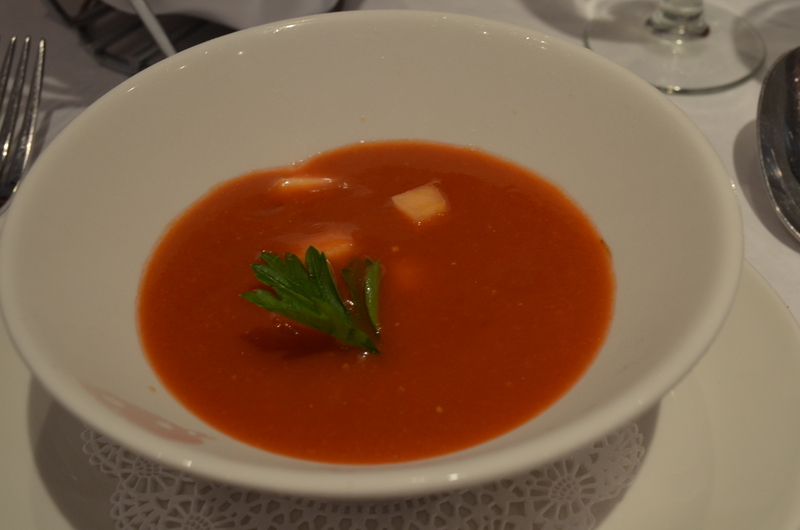 The chef, Florian Hugo, sent out a chilled tomato soup in between courses. It was a wonderful cleanse of the palate before my Eggs Benedict and her Quiche. Both locations are great brunch spots, but they do have a full lunch and dinner menu. 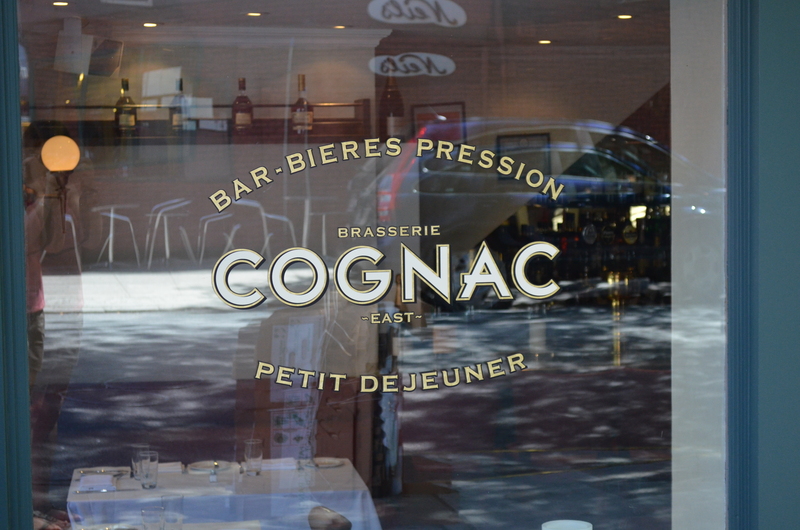 I’m a big fan of French Brasseries and Cognac certainly has the feel and food that makes Brasseries so inviting. 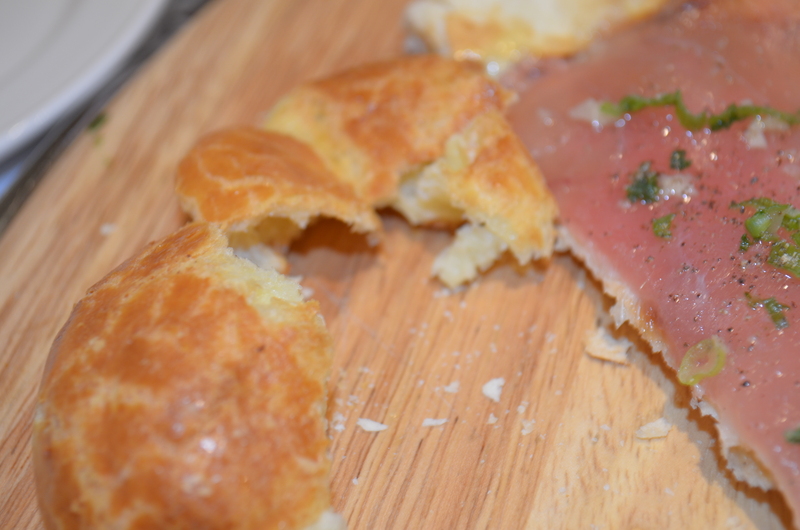 If you can’t get to Paris, stop in for the Tuna Tart or the Gougeres. Or Both. 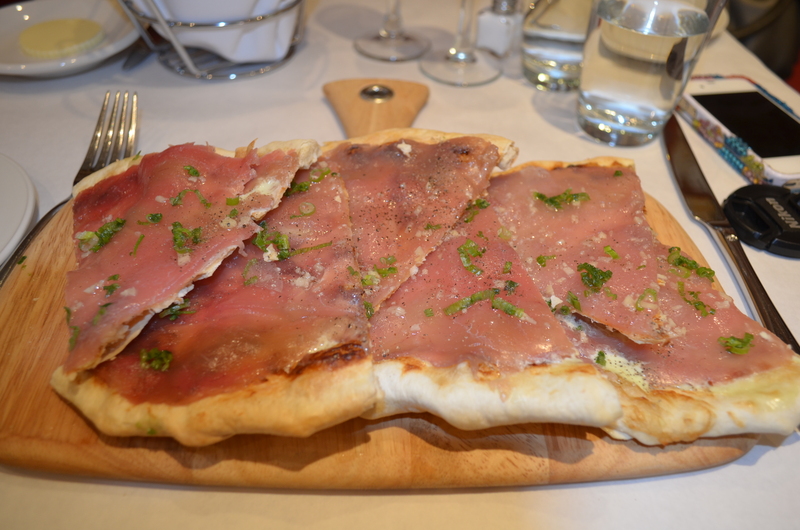 When on the Upper East Side (or Broadway)…Go Here! Eat This! Great review of a great place! Love both Cognacs! Just moved to the UES, I’ll have to try this place out!